The Gastrocnemius muscle is a powerful superficial muscle located at the back of the lower leg and is involved in standing, walking, running and jumping. Often referred to as the calf muscle, it is located behind the tibia (shin bone) and works across both the knee and ankle joints. It extends from the base of the femur (thigh bone) behind the knee, to the calcaneus (heel bone). 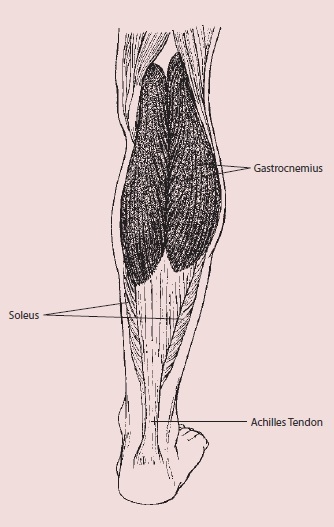 The muscle inserts into the Achilles Tendon along with other muscles. The muscle’s main roles are to plantar flex the foot (point toes away from yourself ) and to assist in flexing (bending) the knee. The Gastrocnemius is commonly injured in sports which require quick acceleration from a stationary position and quick halts in movement, i.e. tennis or squash. In many such cases the injury is caused through sudden eccentric overstretch, i.e. the muscle is contracted yet lengthened forcibly and abruptly. An example of this is when an athlete runs onto a kerb and the ankle drops suddenly into dorsiflexion (point toes upward toward yourself ). The most common place to incur this injury is at the muscular tendinous junction or MTJ of the Gastrocnemius; roughly halfway between the knee and the heel. A calf strain may also be more likely in athletes who have tight calf muscles. Keeping calf muscles strong so they can absorb the energy of sudden physical stress. Stretching out calf muscles before physical activity, i.e. calf raises. Gradually including weights or additional resistance over time. Learning the proper technique for exercise and sporting activities. This will decrease stress on all muscles, including calf muscles. Undertaking fitness programs to develop strength, balance, coordination and flexibility. A sudden pain at the back of the leg, particularly at the muscular tendinous junction. Difficulty in contracting the muscle or standing on tiptoe. Pain on resisted plantar flexion or contracting the muscles against resistance. If the Soleus muscle is damaged pain might be incurred lower in the leg and when contracting the muscle against resistance with the knee bent. Gastrocnemius strains are graded in three categories according to their severity. 1 (mild) Sharp pain (during or after activity), may be unable to continue activity. Return to play – 16-21 days3 (severe)Severe pain at junction between Achilles tendon and belly of the muscle. Return to play – approx. 6 months if surgery is required. The immediate treatment of any soft tissue injury consists of the RICER protocol – rest, ice, compression, elevation and referral to a sports medicine professional. RICE protocol should be followed for 48–72 hours. The aim is to reduce the bleeding and damage in the muscle. The leg should be rested in an elevated position with an ice pack applied for 20 minutes every two hours (never apply ice directly to the skin). A correctly sized compression bandage should be applied to limit bleeding and swelling in the injured area. As pain decreases, gentle exercise and stretching can usually begin in addition to treatment recommended by a sports medicine professional. Rehabilitation should be conducted with caution and under the supervision of a sport medicine professional due to the risk of injury recurrence. Recovery can often be quite a slow process.